Script It! Screenwriting Software: Write Your Own Hollywood Blockbuster! Script It! is the lite version of our professional screenplay development software Movie Outline which was created by a produced writer to take the complexity out of the screenwriting process. While Movie Outline can be used by both the novice and professional writer, Script It! 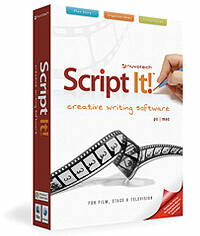 has fewer features but is ideal for the first time writer learning the craft of screenwriting. Both programs use the simple technique of step-outlining to build your screenplay scene by scene, allowing you to focus on each key event of your script without losing sight of the bigger picture. "Script It! helps you organize your thoughts and build your story and screenplay beat by beat, making the process of writing a script less daunting and more intuitive, especially for first-timers learning the craft." Focus on your story and let Script It! handle the formatting through "Tab and Enter" keyboard shortcuts. Auto-complete guesses character names as you type dialogue, suggests scene headings and transitions and automatically paginates your script to industry-standard layout. Script It! also auto-converts elements as you type, so if you enter a scene introduction or transition, the text will change to the correct element, saving you even more time. For novices learning the craft of screenwriting, or professionals with limited understanding of film-financing and production terminology, Script It! has a glossary with over 250 screenwriting and film-making definitions. As a writer, you never stop learning and there is no substitute for reading shooting scripts of produced movies which are now freely available in PDF format on the web and can easily be downloaded for reference. You can then compare various writing styles and see the professional use of terms contained in the glossary. Script It's Title Page Panel also allows multiple pages and automatically paginates which means you can use it as a simple cover page, list your cast for stage plays, or even use it for writing a long form treatment or synopsis independent of the main project's outline and script. As every writer knows, writing a screenplay is not just about the formatting, it’s also about the “process” and part of the process is keeping track of all the ideas that inevitably pop up along the way. Script It’s powerful Scratch Pad feature allows you to easily organize your notes in one place and categorize them into folders such as story ideas, research, character notes, plot lines and script snippets. Through its handy right-click "Send To Scratch Pad" menu option you can quickly select some text, such as a scene or dialogue exchange, and then create an instant copy of it in your Scratch Pad list for future reference or use. To have a good story you need great characters but finding the best name to suit the personality can sometimes be hard. That’s where Script It’s powerful Character Name Wizard comes in with over 140,000 first and last names categorized by gender, origin and meaning. You can filter your search by male or female, origin (such as “French”) and meaning (such as “Happy”) and select from a list of results. You can even generate a list of random names until you find one that fits and create a favorites list for future use. Script It! includes scene by scene story outlines and analyses of Hollywood blockbusters so users can see how successful movies are structured using the step-outline approach. Each breakdown dicusses both story and character development and includes comments on plot devices, screenwriting techniques used and directorial visualization of the narratives. Script It! project files and interface are identical on Windows and Macintosh, making it easy for users to switch between platforms, collaborate with writing partners using different systems and exchange documents without losing any data. Serial Numbers are also valid for both platforms allowing you to authorize your PC and Mac. Movie Outline for Mac is Univseral Binary and will work on PowerPCs and Intel Macs. Script It! includes direct links to Hollywood Script Express which helps you protect your work with intellectual property registration and also offers a unique professional script copying and shipping service to submit your script to agents, managers, producers and contests.. or yourself! Like Movie Outline, Script It! supports text input for international users (provided your system's region settings have been set accordingly) and also lets you choose a specific encoding when exporting your documents so you can be sure your script is displayed correctly when sharing files across platforms with different region settings.